The Monk Moisei (Moses) the Ugrian (Hungarian) of Pechersk, by descent a Magyar, was a brother of the Monk Ephrem of Novotorzh (+ 1053, Comm. 28 January), and of Saint George. Together with them he entered into the service of the holy Nobleborn Prince Boris (+ 1015, Comm. 24 July). After the murder in 1015 of Saint Boris at the River Al'ta, – Saint George also perishing with him, Saint Moisei fled and hid himself away at Kiev with Predslava, sister of prince Yaroslav. In 1018, when the Polish king Boleslav seized Kiev, Saint Moisei and his companions wound up in Poland as captives. Built tall and handsome, Saint Moisei attracted to himself the attention of a certain rich Polish widow, who burned with a passionate desire for him and wanted to make him her husband, after ransom from captivity. Saint Moisei resolutely refused to exchange captivity for slavery to a wife. But, despite his refusal, the Polish woman bought the captive. She tried every which way to seduce the youth, but he preferred hunger pains to banquets of food. Then the Polish woman began to convey Saint Moisei through her lands, thinking to captivate him by power and riches. Saint Moisei told her, that he would not trade spiritual riches for the perishable things of this world, and that he would become a monk. Passing through the area, an Athonite priest-monk gave Saint Moisei monastic vows. The Polish woman gave orders to stretch Saint Moisei on the ground and to beat him with canes, such that the ground became soaked with blood. She sought permission of Boleslav to do with the captive all that she pleased. The shameless woman once gave orders to put Saint Moisei on a bed with her, she kissed and embraced him, but she accomplished nothing by this. 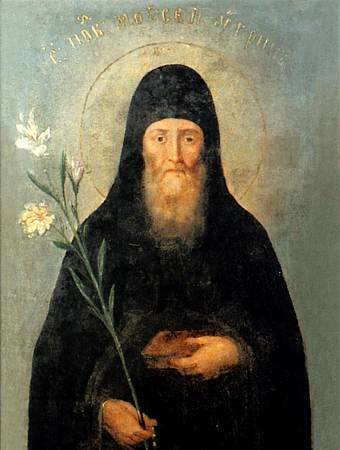 Saint Moisei said: "From the fear of God I loathe thee as impure". Hearing this, the Polish woman gave orders to give the saint each day an hundred lashes, and then to emasculate him. Boleslav soon undertook a persecution against all the monks in the land. But a sudden death overtook him. A revolt arose in Poland, in which the widow also was killed. Having recovered from his wounds, the Monk Moisei arrived at the Pechersk monastery, bearing on himself martyr's wounds and a crown of confessor as a victor and courageous warrior of Christ. The Lord provided him strength over the sufferings. A certain monastic brother, oppressed by impure passion, went to the Monk Moisei and besought his help, saying: "I give promise to keep to the death everything that thou dost direct me". The Monk Moisei said: "Never in life speak a word with a woman". The brother promised to obey the advice of the monk. Saint Moisei had in his hand a staff, without which he was not able to walk because of the wounds which he had received. With this staff the Monk Moisei struck at the chest of the brother who had approached him, and immediately that one was delivered from temptation. The Monk Moisei pursued asceticism at Pechersk for 10 years; he died in about the year 1043 and was buried in the Nearer Caves. With a touch to the holy relics and fervent prayer to him, the Pechersk monks were wont to be healed of fleshly temptations.